This article is designed to help you find the best roof rake for clearing the snow from your home roof. Before we get to our list of the best roof rakes, we have provided some information on why a roof rake may be a handy tool to have around your home to help prevent roof or internal home damage. Snow is beautiful, but it can cause major problems for some roofs. A big concern for many people are ice dams. The University of Minnesota explains that ice dams occur when a layer of ice forms at the edge of a roof and prevents the melted snow from being able to flow off the roof. The water that remains on the roof can potentially start to leak inside the home as it makes it way under the shingles. A roof rake is designed to remove snow from a roof to avoid the potential formation of ice dams. Additionally, it can be used to alleviate the weight of snow on a roof. This is particularly important if your roof is believed to be unable to handle the weight of a given snowfall. A good roof rake will be manufactured to not damage your shingles. As you can see in our list below of the best roof rakes, these rakes are designed with rollers, wheels, or are made from a poly material to help prevent roof damage. Please check out the below video which does an excellent job at explaining how to assemble and use a roof rake. Keep in mind, that the products listed below will vary somewhat in their assembly and design from the demonstration video. This is one of the most popular roof rakes out there and is highly-rated by many people. The key feature of this tool is the patented roller design that guides the rake with ease both up and down the roof. The rollers also help protect the shingles from the rake blade without being a nuisance to the rake’s performance. At 21 feet, this rake is long enough to remove a nice portion of snow from many roofs on ground-level without being too overwhelming large to handle. It is super simply to snap together from its four sections or to take apart for storage. Garelick makes a 16′ version of this rake found here. 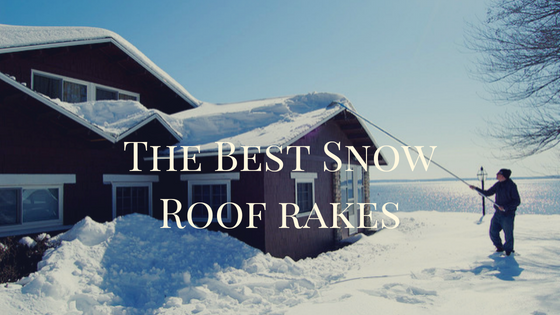 Both the 16′ and 21′ are two the best roof rakes you can buy for your money. This Garant snow rake is mostly made from a lightweight but sturdy aluminum. The rake weighs only 4.21 pounds, which makes it extremely simple for most people to operate. The wide 24-inch blade is made from polyethylene, which is made to not damage your roof as you work to remove snow. At over 16 feet in length, many people will not have a problem clearing a decent area of snow from their roof from the ground. We appreciate how this roof rake breaks down into three manageable sections of approximately 5 feet each (the blade section being a bit longer than the other two). This makes for easy storage. The rake can rapidly be reassembled using a button/hole system to snap the pieces together with little effort. The Avalanche – Original 500 is best seen in action, which is why we posted the above video. As you can see, the frame cuts through the snow and sends it down in chunks via a 17″ x 12′ plastic slide. The slide helps deter snow from tumbling off course and potentially causing a dangerous situation. The 1.5″ wheels help guide the rake over the roof to help create a smooth path. Note that you can buy an extension from the manufacturer to extend upon your existing 16 feet of rake, if needed. This is a well designed roof rake that has been sold to many happy customers. There is no question that this is one of the best roof rakes you can purchase. There are a lot of people that tried to copy this rake, but there is nothing like this original. 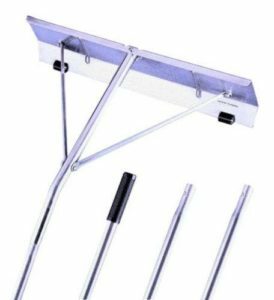 The True Temper roof rake provides a high-quality telescoping extension system. The telescoping feature allows you to extend the rake to various lengths until it reaches its full height of 17 feet. It features a button lock system, which adequately keeps the rake at your desired length. The large, durable poly blade is designed not to damage your shingles as it effectively clears your roof. This is the best roof rake on our list if you are looking for a telescope extension as opposed to a rake that snaps together. The telescoping pole on this Snow Joe snow rake allows you to almost effortlessly adjust its height to various positions. You simply twist the pole and it locks your desired position into place. The peak extension is 21 feet, which is a nice length for most people to clear a sizeable portion of their roof from the ground. At under 5 pounds, this rake is lightweight enough to allow for extended usage without tiring. The rake features a nicely padded end of the handle grip to provide comfort. Here is a great option if you are looking for an inexpensive aluminum roof rake. It features an 24-inch angled blade that sits on rollers to keep your shingles from getting damaged. The rake disassembles using a snap-button system to allow you to store it away without much hassle. At an extension length of 21 inches and a weight of about 6 pounds, this rake has ample length for most people to clear their desired roof area without an excessive weight to make the raking task difficult. While this is much cheaper than some other brands, it is surprisingly durable and very functional for light or even some medium-duty snow removal tasks. Here is a durable 21 ft. snow rake built with a large no-stick graphite blade that is 24 x 7 inches. You will have no problem clearing snow with this snow rake. It conveniently disassembles down to four section for storage. It is equipped with the common snap connectors found on many similar roof rakes. While there are four sections to this rake, if you need less reach you do not have to use all sections. Overall, this is a well-built roof rake that will likely last for the many snow seasons to come. This Peach Tree roof rake provides a nicely designed telescoping extension that allows you to extend the rake to various lengths. It is only 5.8 pounds, which provides easy maneuverability. The blade is 25 inches, which is one of the largest blades on our list. You will have no problem quickly removing snow with this model. Since this is a poly blade, it should not disturb your shingles while clearing the roof. We especially like the padded handle grip that is attached to the end of this rake. This allows for a nice level of comfort and grip while you actively remove snow from your roof. Clearing piles of snow off a roof can be dangerous. Please take note of some of the below safety tips before you use your roof rake. Be aware of where you are swinging your roof rake. Be particularly careful when working around utility lines. The length of a standard roof rake makes it easy to hit object by accident. Avoid climbing on ladders. Holding a roof rake on a potentially slick ladder is not a good combination. Do your best to clear the snow from ground level. Be aware of the path that the snow is falling from the roof at all times. Be aware of other individuals that may be in the path of the falling snow. Clear snow more often rather than letting the snow pile up. Use a partner, if possible, who can assist you as needed. Check the weather and dress appropriately to avoid frost bite or other medical problems related to the snow/cold. Take your time and do not over do it. Cold temperatures and physical activity outdoors can take a toll on some people. 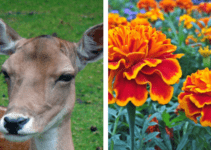 If you have a large area to clear, consider working with a partner or take frequent breaks. Remove icicles that are hanging where people walk to prevent injury if/when they fall. Will a roof rake damage my roof? It is possible to damage your roof with a roof rake. However, if you buy one of the best roof rakes on the market, they are designed with features such as rollers or wheels on the blade to prevent damage. You may want to consider removing all but a small layer of snow so that you are not digging down to the shingles to potential harm them. How long is a roof rake? You will typically find roof rakes that measure about 20 feet. Of course there are exceptions to this length here and there. Can I make my own roof rake? Go for it. You do not need to buy an expensive roof rake if you are handy enough to build one on your own. It is not a complicated technology if you have the available material. You can watch this video of someone who made their own roof rake with PVC. How does a roof rake work? See the video at the beginning of this article for a general idea of how a snow roof rake works. Do I really need to rake my roof? If your roof is structurally sound, to code, and your house has proper insulation you likely do not need to use a roof rake. Most roofs are constructed to hold much more snow than we receive on average. However, snow does cause real problems for some homeowners and a roof rake can help deter certain damage caused by this snow. How to assembly a roof rake? Most roof rakes snap together via a button system or have a telescoping handle. You should check the manufacturers instructions on how to assemble the rake properly. We would estimate that most rakes can be assembled in a few minutes by most people. Will a roof rake prevent ice dams? Generally, a roof rake clears the edge of a roof and potentially a bit beyond. Ice dams tend to form near the edge of the roof causing water to remain stagnate on the roof. By clearing the roof edge of snow, you reduce the risk of an ice dam forming and potentially causing interior water damage or other problems. Can’t I just use a regular shovel and ladder to clear my roof? It is not recommended to climb a ladder during cold and/or slippery conditions. Additionally, a typically snow shovel can damage your roof since it typical lacks protection for the shingles on the blade.